This was a lovely old clock to work on and, as a bonus, I had not worked on a chain driven 30 hour grandfather before. The movement was in good condition although the oil was thickening up and it was a bit grubby; a standard cleaning fluid brought some life back to the brass work and got rid of the dust and oily residues. 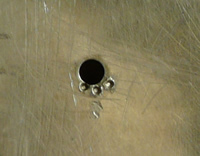 It is perhaps a little unfair to comment but my mentor Alan Brockbank (Jean’s step father - see elsewhere) would not have approved of the quality of the previous repair with bushes peened in and some of the bearing surfaces closed up with a centre punch; for a quality clock, or any clock for that matter, this is considered as bad practice. 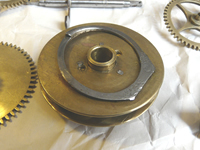 However all the bearings were in good condition and the movement just needed a clean and oiling. E G Arnold Lyth June 1974 Hmm! I have found a bit on the internet about E Burton; the following are some extracts. He was of Finkle Street, Kendal, and his name appears in the " Universal British Directory," published in the " Yorkshire Post," 25 July, 1908. There is a record of a grandfather clock by him: dial silver on copper(probably brass) with silvered chapter circle and a monthly calendar. 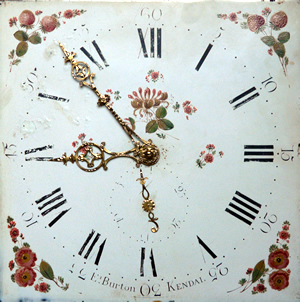 The Burton family were clockmakers at Whitehaven, Ulverston, Hawkshead and South Shields. From Notes on Some Westmorland Clockmakers. By T. CANN HUGHES, M.A., F.S.A. Communicated at Lancaster, 14th September, 1933. Emanuel Burton (I) was born in Highgate in 1732, the third son of William (I) and Jane. He married Deborah Lancaster in 1756 in Kendal and lived in Stricklandgate, where William and Joseph were born, until 1760. From 1761 to about 1766, the family lived in Fish Market in Stramongate Ward, for which Emanuel was Churchwarden in 1764 and 1765. Their next move was to Allhallows Lane in Highgate around 1767, where Emanuel's father still lived, and here they stayed until Deborah's death in 1805. Emanuel may have moved to live with his son James in Whitehaven, or possibly died on a visit, for he was buried there in November 1809. He was identified as a clockmaker on several occasions — when Churchwarden in Kendal in 1765, in the Universal British Directory of 1790 when Emanuel Burton senior and junior were recorded, and finally in the burial register of St. James's, Whitehaven. Emanuel (II) was born in Fish Market in 1764, the third son of Emanuel (I), but the oldest to survive to maturity. He must surely have learned the trade of clockmaking from his father and grandfather in Allhallows Lane, where the family had moved about 1767. He married Margaret Newby in 1786 and their first child, Emanuel, was born in Finkle Street the next year. In 1789, Emanuel (II) bought two front burgage houses on the south side of Finkle Street for £280 from Eleanor Bell; from Land Tax records and Jury Books it is found that he remained in Finkle Street for the remainder of his days. 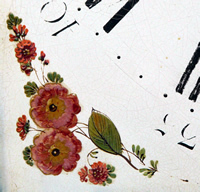 He is variously described as clockmaker or watchmaker and must have been active as both; when he was buried, aged 65, on 18 February 1830, he was "Clock and Watch Maker and Burgess of Kendal". The Westmorland Gazette of 20 February 1830 recorded that he was a "respected townsman and deservedly esteemed as an upright character". 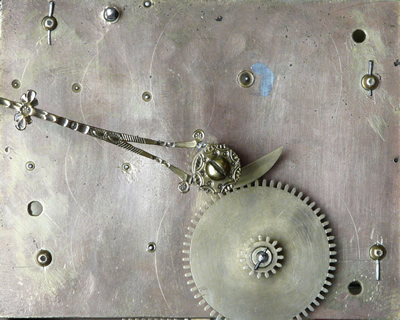 With his passing, it would seem that 100 years of Burton clockmaking in Kendal had ended. 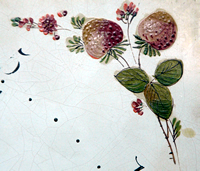 His son, Emanuel, did not follow him but purchased a commission in the Army. 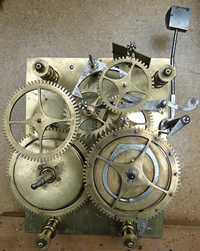 Emanuel (II)'s cousins and their children however were to continue the tradition of clockmaking in many places in the North of England. 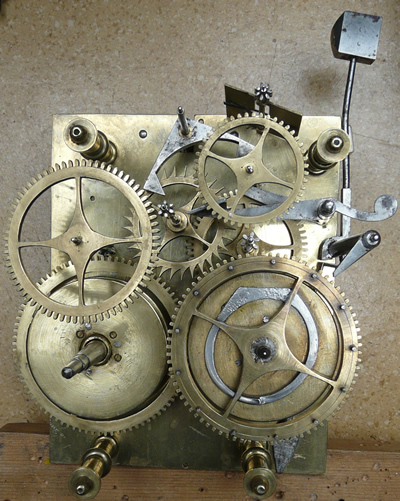 The Burton Family of Clockmakers. 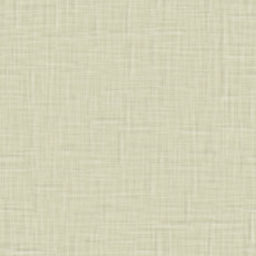 By M. J. WATTS, M.A., Ph.D. and C. T. WATTS, B.Sc., Ph.D. In April 2016 a very similar clock was put up for auction on ebay. The description was as follows along with two of the photos. E.Burton, KENDAL,1790-1828, Emanuel Junior. Grandfather Clock. This Clock ... is in fantastic condition for the age. Is fully working and comes complete with everything as you can see in the pictures. It fetched £595. 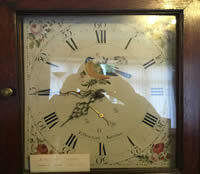 Other clocks by this maker are also to be found on dealer's web site for upwards to around £2500.